The dojo events below are open to the public. You do not have to be a member to participate. Please click the links to learn more. View all upcoming public events on our Eventbrite site. April 27, Sat. 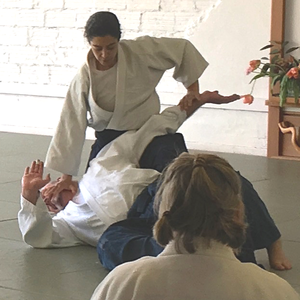 10am-noon: Aikido Appetizer, our Spring Open House, free, open to all! All public events are open to Regular Adult dojo members at no additional cost. Members, please save these upcoming dates and support to the best of your ability. Unless otherwise specified, all events are held at the dojo, 6415 SW Macadam Ave.
Apr. 6, Saturday: Portland area dojos gather for the annual Friendship Seminar this year hosted by Two Rivers Aikikai at SE Belmont and 30th. Van Amburgh Sensei to teach in the morning segment. Schedule: 10am- 12:30, lunch break, 2:20pm - 4:30pm. Regular Sat. class at the dojo is cancelled in support of the seminar. Come on over to Two Rivers Aikikai for any portion of the day. May 20: deadline for early registration discount on BNA Summer Camp.